Some of you may know Dan Harris as a correspondent for ABC News, and he has been involved in other shows as well. In 2004, he had a panic attack on live television and subsequently discovered meditation, which helped with his anxiety and depression. I've listened to some of his interviews, and I think reading his book before the meditation course will be very helpful. It looks like a short book, so I shouldn't have any trouble finishing it in two weeks. Update (Dec 29/18): I loved this book and wanted to slowly savour it. Dan Harris writes in a way that is very easy for me to read--it's as though a friend is speaking directly to me. The book was hilarious in parts, and I laughed aloud more than a few times. The author was also very candid about being skeptical of meditation, and some of his thoughts around it making you complacent, which are some of the same reasons I've been apprehensive about meditation in the past. While Dan Harris didn't attend the same type of 10-day meditation course that I did (his was a paid course and was not taught by S. N. Goenka), my experience seemed to echo his pretty closely, even up to seeing a bird at some point during the 10-day course that triggered feelings of complete contentment and peace. I plan to read this book again in the near future, as I think I will see it in a different light having since gone through my own silent meditation retreat. I stumbled across this book in our condo building's "library," and it got great reviews on Amazon, so I decided to give it a try. This book is rather long, and I don't know how interesting I'll find the material, so I'm not sure I'll be able to finish it before the meditation course. This is a book I read a while ago, but forgot to include in a previous post. I borrowed the ebook from the library, so it is not pictured above. I loved the first half of this book! I found it incredibly insightful, and the passages really resonated with me. I had a lot of AHA moments during the first half of the book, and I would periodically reading stop to take notes or set the book down to ponder my thoughts. However, as soon as I got to the second half of the book, this stopped. I couldn't seem to relate to anything past the midpoint of the book, and I ended up skimming the rest. 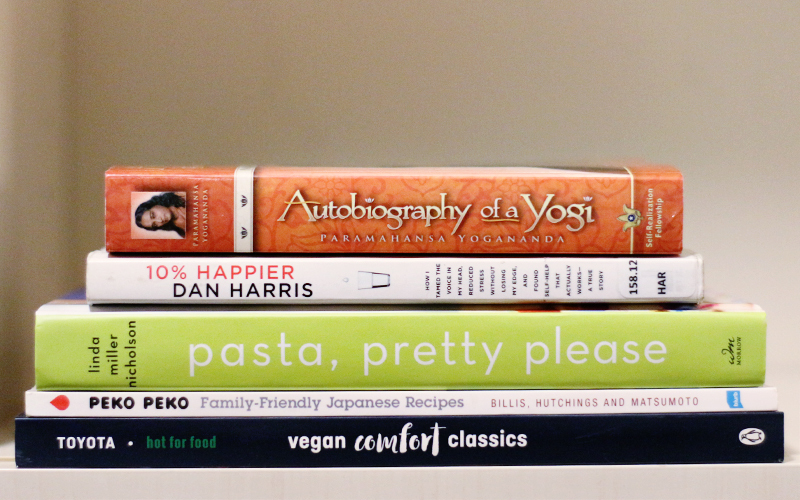 I've been reading a lot of thought-provoking books lately, so I thought I would include a few cookbooks that I'll be leafing through over the next little while. These will likely be a lot of fun to read and will hopefully give me a lot of inspiration to keep cooking new recipes well past eat-at-home month. My friend and I received this book when we went to CityLine earlier this month. It's a lovely book, but I'm not sure how practical it will be in my life. I've never made pasta from scratch, and while I'd like to give it a try one day, I don't really see myself making it regularly. I may decide to add this to our building's library once I'm done leafing through it. This is a self-published book on Blurb that was created to support the GlobalGiving Japan Earthquake and Tsunami Relief Fund. I was excited to find this in our building's library, and I'm hoping to discover some new recipes to try. My friend and I were lucky enough to attend CityLine for a second time, and we received this cookbook as a result. I loved the segment we watched with Lauren Toyota, and I was ecstatic to have a copy of this book. I'm eager to incorporate more plant-based recipes into my cooking. Update (Jan 25/19): I've flipped through all of the above cookbooks. While I enjoyed certain aspects of each, I won't be keeping any of them in my collection. The above books will probably take me into the new year! I'll continue to provide updates within these blog posts. You can find my previous "Currently Reading" posts here and here.